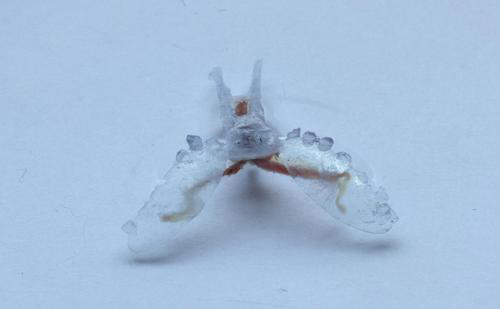 In one of the latest examples of designers combining mechanical parts with organic tissue, Case Western Reserve University researchers created a 3-D printed robot that's less than 2 in. long, printed out of flexible polymers and powered by mouth muscle tissue from a sea slug. They went with sea slug muscle tissue because mechanical actuators were not as safe and tended to be rigid in such a tiny robot. An external electric field controls the robot, though its creators plan to use sea slug nerve tissue as a controller in future versions.